Last night I began the intimidating task of shifting through hours of footage to create a short video about our Cycle Oregon experience. One moment that stood out crystal clear for us was the first night in Bly, OR when a local council member welcomed us to Klamath country. The behind the scenes of the actual filming is less than glamorous. I was just settling into a beer in the back of the stage when the evening announcements begin. I quickly bolt up and run with my tripod and camera (with a bulk of the audio gear in the tent) and start recording. Fortunately, I was able to capture a moment that I think sums up Cycle Oregon for us. 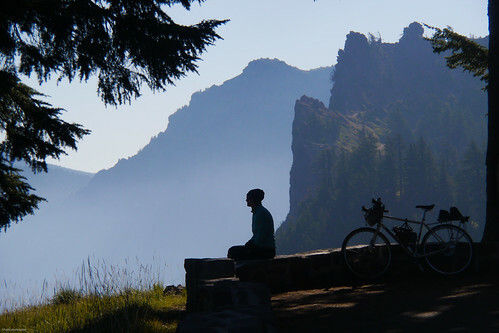 Cycle Oregon is ultimately about connections. It connects friends, volunteers and most importantly it connects rural and urban Oregon in a unique shared experience. The finished product of this video is still months down the road, but I couldn’t help but share this one moment since it is the essence of the Cycle Oregon experience. Sit back and enjoy!